Everyone is talking about writing content. 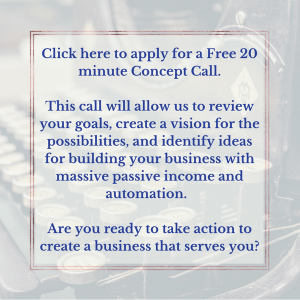 It’s a virtual water cooler buzz word for entrepreneurs and bloggers. Write content, increase your exposure. That’s great and all, but how do I know that my content will resonate with my people? Great question. Really. Because, if you’re going to put something out there, whether it be a newsletter, blog post, video, podcast… the list goes on, you want it to engage your audience. To assist you in this little adventure, I put together a bite-sized list of 5 key elements to check off your list before calling your content creation complete. Distributing high quality content and delivering on your promise is the key to bringing in followers and selling your product or service. Be sure the information you’re sending is helpful and either leads them through story to a positive result you or others have achieved (that could potentially be theirs), or leads them through steps or actionable information to a tangible result. This is the time to give away your goods. Giving information on how to ease their pain points will allow them to know that you’re their solution, while giving them actionable results. The way you structure a message and deliver it should be consistent with your branding, as well as your personality. Be sure your message is clear, easily understood, and directed towards your customer’s needs and wants. And, it should be something that can be consumed in small doses. Breaking it up into smaller pieces is going to resonate with a larger group of people. Storytelling, being relatable, and adding personality are great ways to increase engagement. Followers want to feel connected to you. Invite them in. Share something interesting you did recently, or a trip you enjoyed. Live stream in your home. Let them get to know you. Consistency is King. People like to know what to expect. Delivering your material to them on a consistent basis builds trust, which leads to sales. Let them know that you deliver on your promises before they’re even a customer. Keep your writing in a conversational tone. This approach results in a more relatable, easier to consume article. Use contractions, break up long paragraphs, and see your open rates increase. You don’t want to seem robotic to your readers. They’d much rather meet you in person and feel like they already know you based on your writing style. And, in the same vein, don’t speak over their heads. Your industry jargon isn’t their every day way of speaking, so be sure to keep your information at a level that’s simple to understand, while still getting your point across. Now go create something amazing and share your knowledge and gift with others.